Simon & Schuster, 9781451699432, 352pp. For fans of Cormac McCarthy and Annie Proulx, “a wonderfully cinematic story” (The Washington Post) set in the post-Katrina South after violent storms have decimated the region. The Gulf Coast has been brought to its knees. Years of catastrophic hurricanes have so punished and depleted the region that the government has drawn a new boundary ninety miles north of the coastline. Life below the Line offers no services, no electricity, and no resources, and those who stay behind live by their own rules—including Cohen, whose wife and unborn child were killed during an evacuation attempt. He buried them on family land and never left. But after he is ambushed and his home is ransacked, Cohen is forced to flee. On the road north, he is captured by Aggie, a fanatical, snake-handling preacher who has a colony of captives and dangerous visions of repopulating the barren region. Now Cohen is faced with a decision: continue to the Line alone, or try to shepherd the madman’s prisoners across the unforgiving land with the biggest hurricane yet bearing down—and Cohen harboring a secret that poses the greatest threat of all. 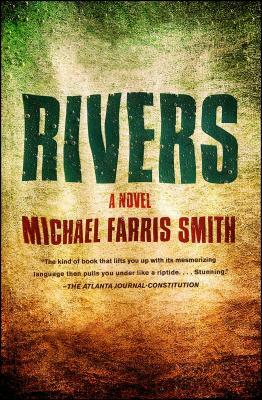 Eerily prophetic in its depiction of a Southern landscape ravaged by extreme weather, Rivers is a masterful tale of survival and redemption in a world where the next devastating storm is never far behind.“This is the kind of book that lifts you up with its mesmerizing language then pulls you under like a riptide” (The Atlanta Journal-Constitution). "While there are obvious similarities to Cormac McCarthy, Smith most puts me in mind of his fellow Mississippian Larry Brown. They share the same smooth-worn grace running toward minimalism and offhand masculine power." "Rivers is a novel that forces the reader to face terrifying possibilities and haunts long after the last page. Smith captures the essence of humanity in an almost post-apocalyptic world and his writing earns him a well-deserved place next to greats like William Faulkner or Cormac McCarthy."